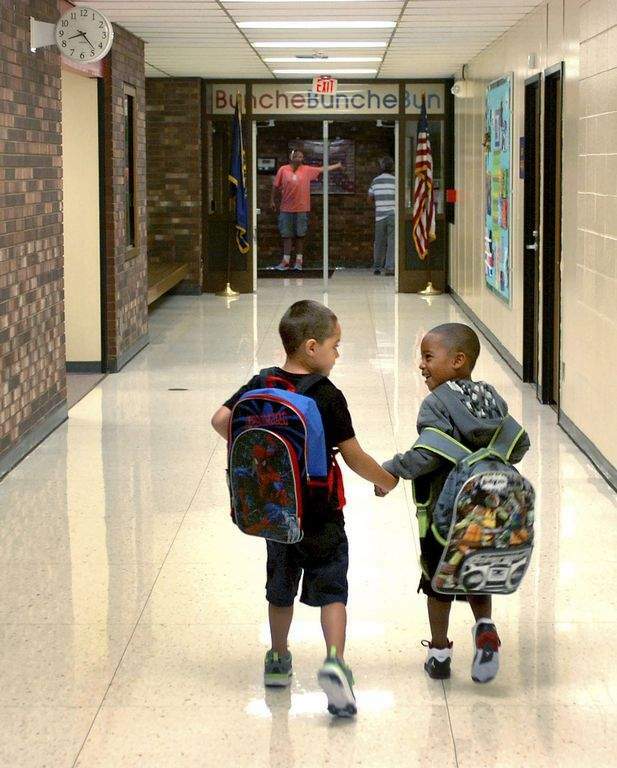 Courtesy Third-grader Devon Wright, who as a kindergartner was photographed helping another student on his first day of school. A framed photo of Devon's kindness was recently presented to former state Sen. David Long. The moment – Devon showing a younger classmate the way on the first day of school in 2015 – was captured in a photograph Robinson treasures. Charles Cammack Jr., chief operations officer, also has a print hanging in his office. It was taken at Bunche Early Childhood Center by a Journal Gazette photographer. “I will never forget the other young man (in the photograph) didn't have a clue where he was going, and neither did I,” Robinson said during a January school board meeting, Devon standing near her. 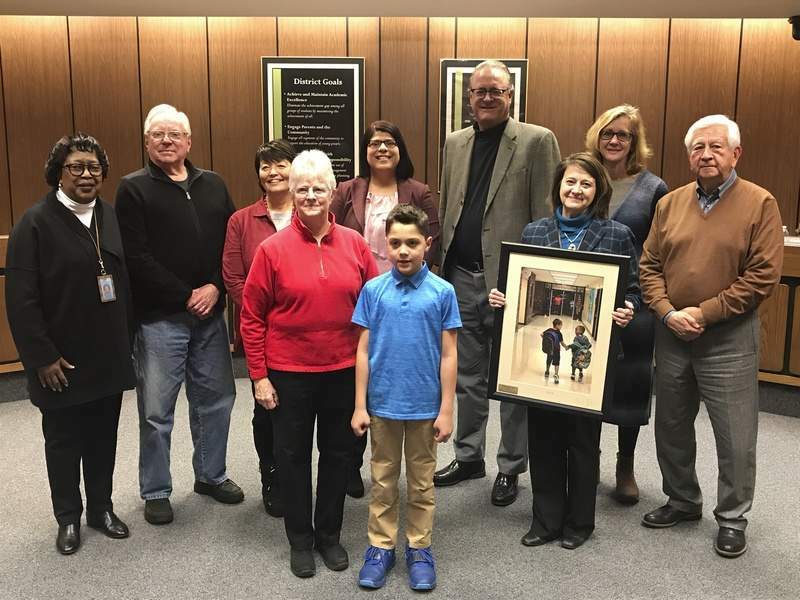 Robinson and Kathy Friend, the district's chief financial officer, presented a framed print to former state Sen. David Long in appreciation of his relationship with the school district. “Sen. David Long, 1996-2018, thank you for your commitment to the students in Fort Wayne Community Schools,” Friend said, reading from an inscription on the gift. • Students in fourth through sixth grades have until Feb. 28 to enter an essay contest sponsored by Indiana's Family of Farmers in celebration of National Ag Day. Winners will receive $200 for first place and $100 for second place and may attend a recognition ceremony at the Indiana Statehouse on March 18. Go to the Indiana's Family of Farmers Facebook page for details. • University of Saint Francis will have the Rev. Joseph Chinnici speak about “Faith, Reform, and Mission: When the Church Becomes an Obstacle” at 3 p.m. Feb. 17 in the North Campus auditorium, 2702 Spring St. The lecture is free and part of the philosophy/theology spring lecture series. • Indiana Tech's College of Professional Studies will host an open house from 5:30 to 7:30 p.m. Feb. 21 in the Seitz Conference Center in Andorfer Commons, 1600 E. Washington Blvd. Go to ind.tc/openhouse for more information or to RSVP. Working adults seeking a manageable way to fit education into their lives are encouraged to attend. • Financial aid professionals will volunteer at Ivy Tech Community College to help college-bound students and their families file the Free Application for Federal Student Aid, or FAFSA, from 2 to 4 p.m. Feb. 24. Sites include the Fort Wayne campus, 3800 N. Anthony Blvd., and the Warsaw location, 2545 Silveus Crossing. The event coincides with College Goal Sunday, a charitable program of the Indiana Student Financial Aid Association. Go to www.collegegoalsunday.org for more information, including items to bring. • The University of Saint Francis School of Creative Arts will host visual arts and music technology workshops from 9 a.m. to 2 p.m. March 8 for high school students and teachers. Go to bit.ly/SOCAworkshop2019 for online registration and session information. Call 260-399-8064 for further details. • Meijer donated $1,006.50 in gift cards for Ivy Tech Community College Warsaw's newly formed emergency food and supply pantry. Circle of Ivy, the women's philanthropy group at the school, also raised more than $2,600 for the project. The combined funds are expected to keep the emergency pantry stocked for about a year. • Lara and Tony Gaerte of Century Aviation in Auburn donated avionics equipment and manuals to the Ivy Tech Foundation for Fort Wayne's aviation maintenance technology program. The donation was appraised at $55,000. The aviation program prepares students for taking the Federal Aviation Administration licensing exam. • The University of Saint Francis has reduced per-credit tuition by up to 40 percent for multiple master's degree programs. It now offers differentiated pricing for its graduate programs to ensure each program's tuition is aligned to the market. As part of the cost adjustment, the university is phasing out its Alumni Tuition Rate. For more information on the new rates, contact Graduate Enrollment Services at 260-399-8000. • These University of Findlay students were awarded endowed scholarships for the 2018-19 academic year: Kaytlyn Creed of New Haven and Cayla Ebersole of Columbia City. • Fort Wayne Mayor Tom Henry; his wife, Cindy; Purdue University Fort Wayne Student-Athlete Leadership Team President Victoria Mills; and Chancellor Ron Elsenbaumer signed an agreement on Feb. 1 establishing the SALT Endowed Scholarship. Henry co-signed as a guarantor to help raise the money needed for the endowment fund. This marks the first time an endowed scholarship has been established by a student organization. SALT decided to establish the $25,000 scholarship as part of the Chapman Challenge. SALT agreed to raise two-thirds of the money with Howard and Betsy Chapman donating the remainder. To be eligible for the scholarship, candidates must have completed one year of athletic eligibility at Purdue Fort Wayne and be in good standing within NCAA rules. Preference will be given to student-athletes not already on a full athletic scholarship with a minimum GPA of 3.0 and involved in the Fort Wayne community. • Sue Ehinger has been named the 2019 Linda L. Ruffolo Dedication Award honoree and will be honored May 3 at Tapestry, which is sponsored by Purdue University Fort Wayne and Parkview Health. • The Boys & Girls Club of Huntington County was recently awarded an $80,000 grant from Indiana's Office of Early Childhood and Out-of-School Learning. • The Accreditation Council for Business Schools and Programs has reaffirmed accreditation of Trine University's business programs. The organization accredits the bachelor's of science in business administration; associate in accounting; and associate in business administration programs. The business programs were first accredited in 2008. The university must go through the reaffirmation process every 10 years.